In my household, weekdays we usually try to eat vegetarian meals. First three days of the week are for veggies, Thursday for eggs or chickpea or any beans, Friday for fish or seafood and weekend for some indulgent food with meat. 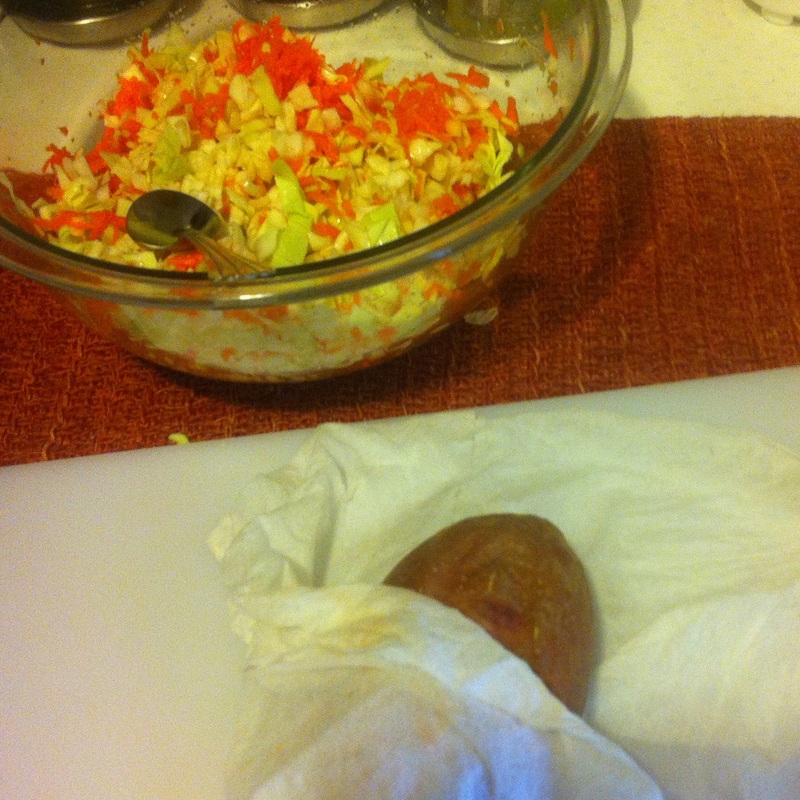 So, yesterday when I checked veggies in the fridge I found green cabbage sitting in there for quite a long time. Though I like stir fried cabbage, (which I usually cook on busy days)for its savory taste and crunchy texture, I thought I would give a try for cabbage dumplings/koftas as it was in my list of TBT (to-be-tried) recipe for a while now. Its made with simple ingredients and came out very well. 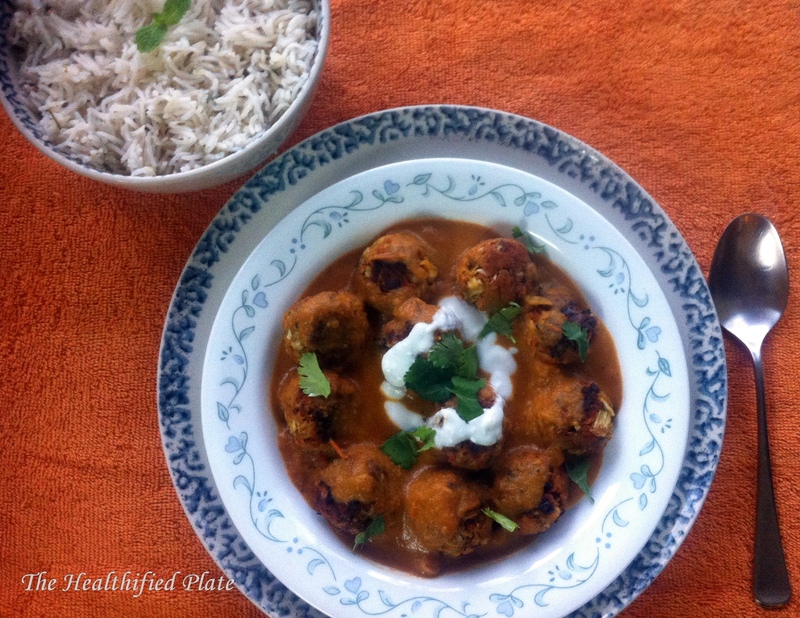 And I think, it is a good alternative for popular malai koftas (dumplings made with paneer/cottage cheese) or meat balls if you want vegetarian and less calorie option. I served it with jeera(cumin) rice but I think rotis would go great with it. I adapted this recipe from www.tarladalal.com. The original recipe called for cottage cheese(paneer) along with grated cabbage and used chickpea flour to give binding. 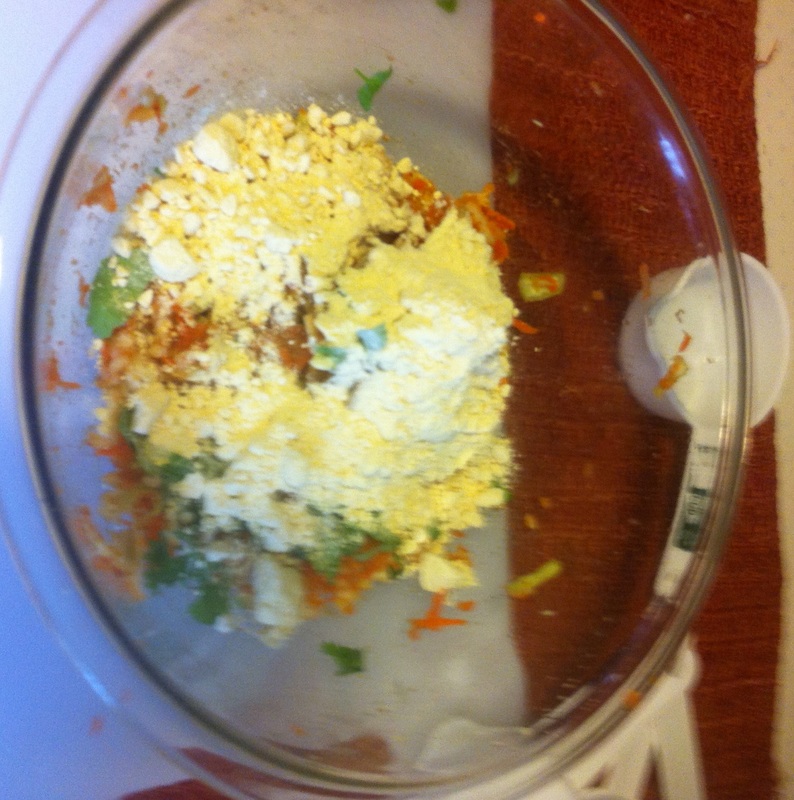 I omitted paneer and added grated carrots and mashed potato to finely chopped cabbage. 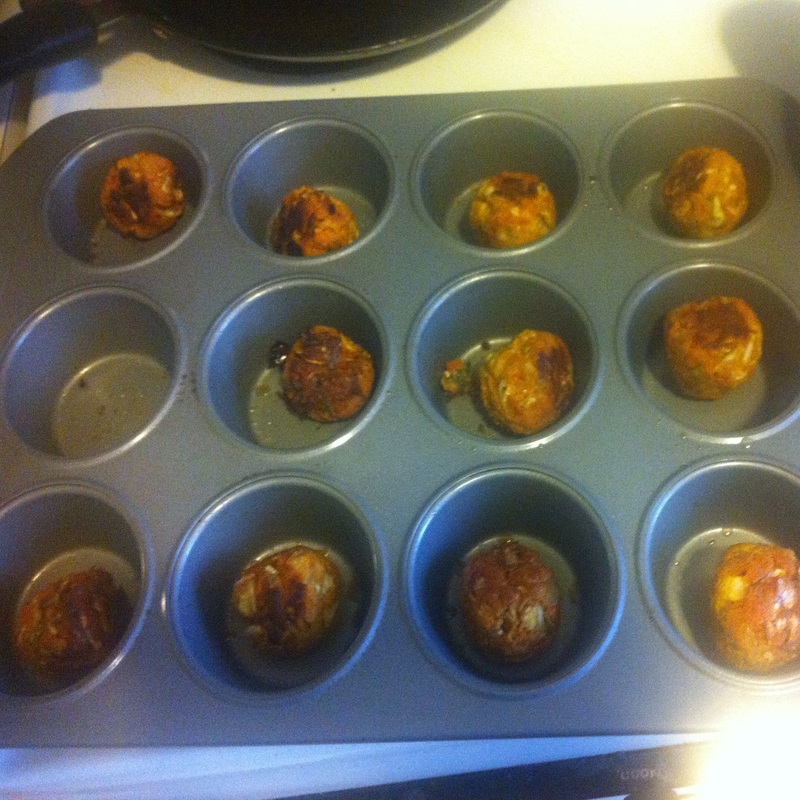 And I baked them in my muffin tin instead of frying them. The original one used tomatoes and pumpkin with whole spices for the gravy. I again omitted pumpkin and just increased onions to thicken and used powdered spices to give smooth gravy. I liked her idea of using cornstarch with low fat milk to thickening the gravy and used it in my version too. Check this recipe out and do give it a try to turn the boring cabbage to a delectable one. Add garam masala, kasuri methi, sugar and cornstarch dissolved in milk (Carefully mix the cornstarch in milk and stir continuously to avoid lumps) and cook for a min. Check seasoning and adjust according to taste. You can even shallow/deep fry the dumplings or even steam it for 15 mins. 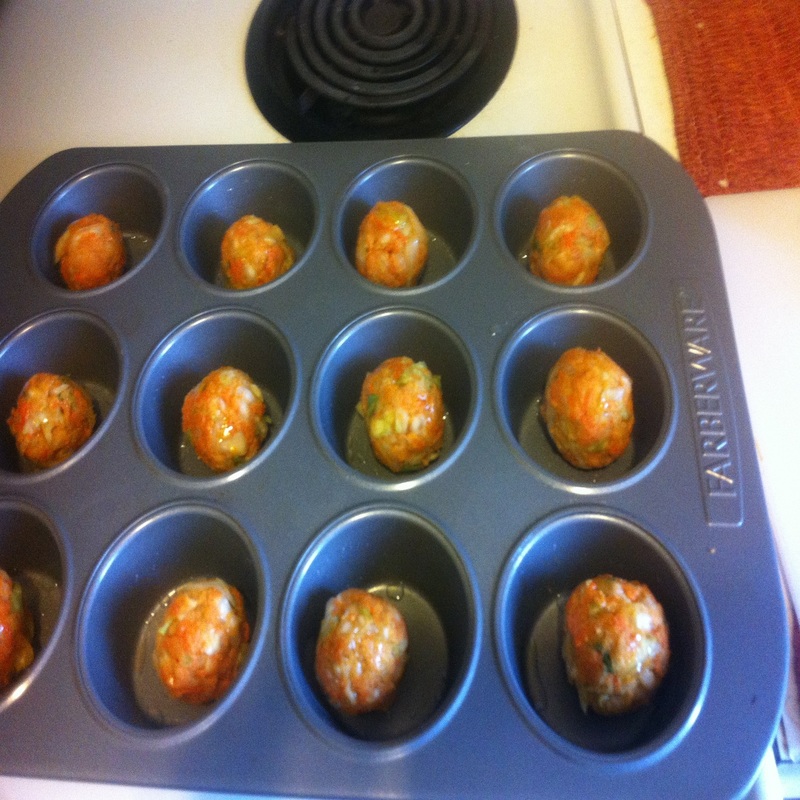 Alternatively, you can microwave them brushing with oil and 5 mins on high.